Cheeks are getting rosy, there is crispness in the air, and our eyes are being dazzled by the colors of the season. Yes, fall fans, Squashtober has arrived. Let’s hear it for some of the last local produce of the season, the totally underrated, utterly awesome squashes. I have to admit I get excited when I see giant bins piled with pumpkins, acorns, butternuts, and delicatas arrive at my grocer. 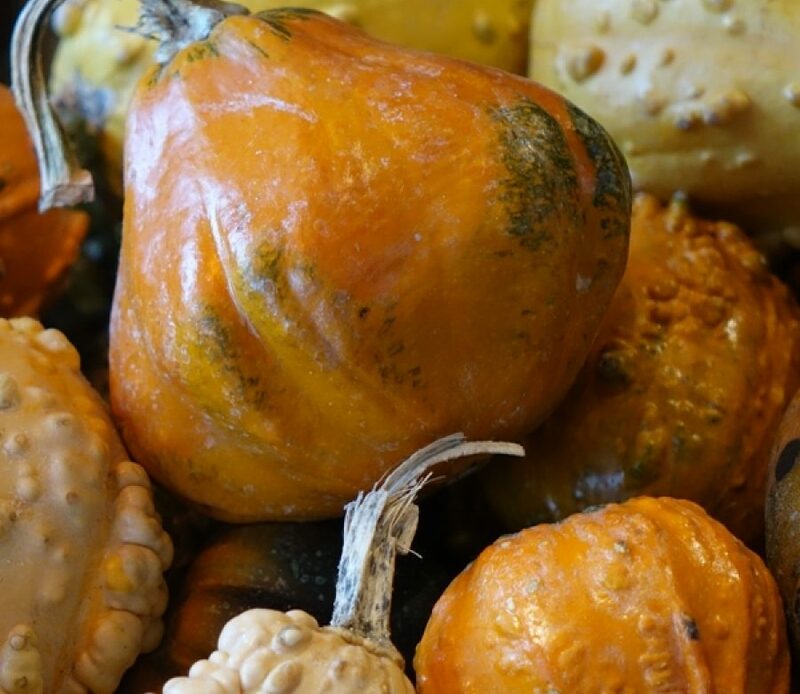 To me squash is like a warm cozy vegetable sweater that makes me glad that fall is here. Although squash seems to handle its unbecoming name with a tough skinned approach, it really has another much more sophisticated title that it rarely brags about, Cucurbita. You pronounce it cuke-curb-bit-uh, with emphasis on the curb. I don’t know why they picked the name squash, it elicits no brilliant or glorious visions whatsoever, but regardless, it is a seriously genius genus. Imagine a vegetable that can last for six months without refrigeration. We may owe our very human existence to this life-sustaining plant. Lets face it, even the pioneers in America planned a holiday to celebrate it with pumpkin pie and mashed squash, probably because they were so grateful for its ability to get them through the harsh winters. (See what I mean by vegetable sweater?) It can brag that it’s the first domesticated produce, going as far back as eight-thousand years ago. In addition, its robust contribution to good nutrition is a great reason to be number one in the history books. Manila Clams Pasta with bucatini, roasted Hubbard squash, preserved lemon, smashed tomatoes (available through October 28 or try the recipe at home). Candied Blue Hubbard Squash with mascarpone and candied pistachios (available through October 30). Find more recipes in Salty’s Chef Jeremy’s blog Here to Squash Your Doubts!